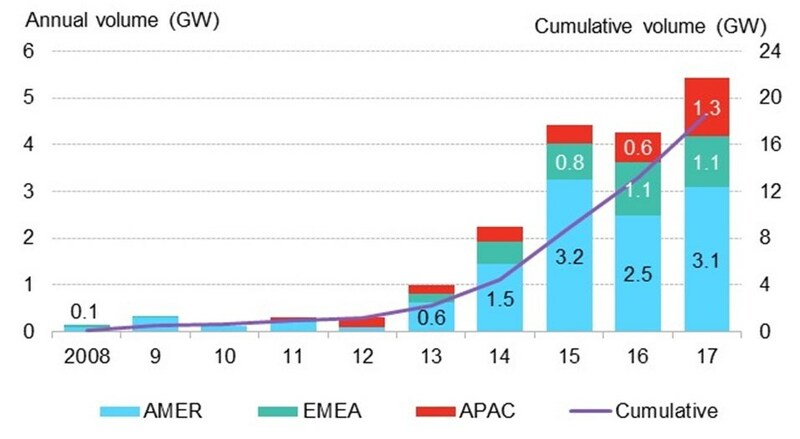 Despite looming policy uncertainty in the two most active markets, corporations globally purchased 5.4 gigawatts of clean power through long-term contracts, surpassing 2015’s record. London, Washington D.C. and Hong Kong, January 22, 2018 – Corporations signed a record volume of power purchase agreements, or PPAs, for green energy in 2017. The increase in activity was driven by sustainability initiatives and the increasing cost-competitiveness of renewables, Bloomberg New Energy Finance (BNEF) finds in a comprehensive new report on corporate procurement activity globally.